The Chelsea forward - who has yet to start a Premier League game - initially missed out on a place in Gareth Southgate's squad for the European Qualifiers against Czech Republic and Montenegro. But after being rerouted from the England U21s in Bristol to join up with the full squad at St George's Park, England skipper Kane says a player he believes "has the ability to play at the highest level" will look to stake his claim for permanent inclusion. "He's come in and wants to take full advantage of his opportunity," said Kane. "He looked like he was enjoying himself out there today, scoring a few goals in training. "We are excited to have him. Everyone is fighting for places in this England team and I'm sure he sees this as an opportunity for himself. "The youth aren't afraid to go and express themselves, especially the attacking players. That's what we want. "As an England team we want that flair and flexibility. So far, so good. 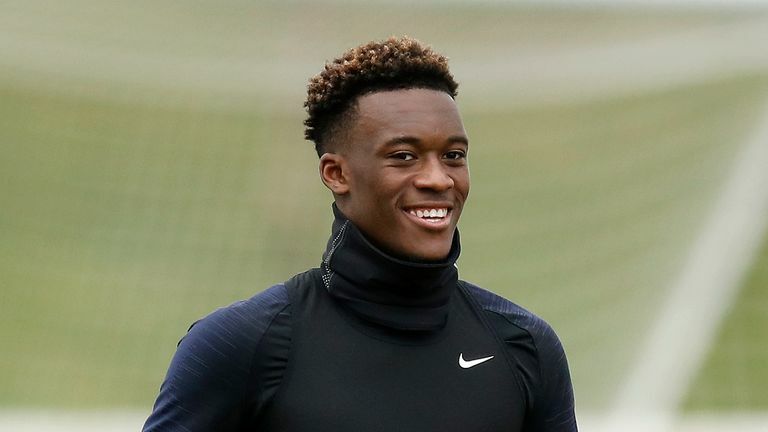 Callum Hudson-Odoi says he was "shocked" to find out he had been called up to the England senior squad for the first time. "It's a great sign in this country that we are creating these kinds of players." Kane's journey to the top of the game saw him go out on loan from Tottenham to four different clubs. "Everyone has a different path to the top," added Kane. "Mine was going out on loan and trying to get the experience there. "Callum has had a taste of cup competitions and a little bit in the Premier League. He will want to play and gain experience at the highest level. The youth aren't afraid to go and express themselves. That's what we want. It's a great sign in this country that we are creating these kinds of players. "We will see how his career progresses over the next year or so, whether he does that where he is now or maybe out on loan with another team. For young players coming through, it is vital that they play. "Everyone knows he is a fantastic player but in football you go through ups and downs and that's part of the journey. "I'm sure it was a tough one for him. He's enjoying the season he has been having so far," Kane said of Rice's decision. "He took the time with his family and close friends and the decision he made is one he thinks will be best for his future and no one can blame him for that.